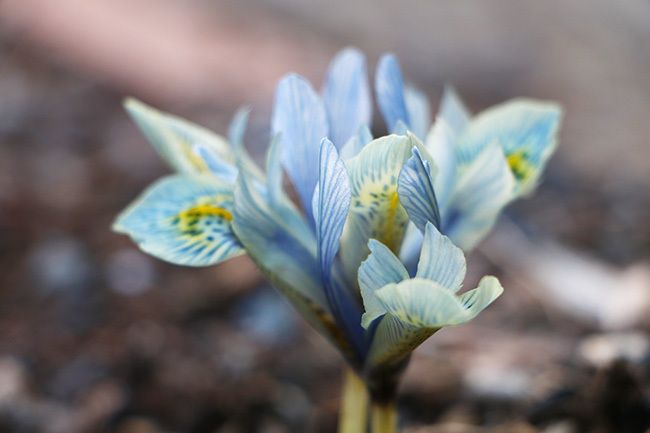 The well know early blooming Iris reticulata 'Katherine Hodgkin', perhaps the perfect subject for my new camera (I'm switching from Nikon to Canon, so it's a bit like switching political parties. The quality in even the past 5 years, has progressed so much, plus with the opportunity to create videos, I think I will get more use out this camera. When I think back to all of the 'first day's of spring' that I've experienced, today really seems no different - I mean aside from the fact that we had the warmest winter ever recorded, after the coldest and snowiest winter ever recorded last year, and that now we are buckling down for a late winter snowstorm tonight, it's all good! Most of my time this week has been spent in the greenhouse, with only a few crops planted outdoors - parsnips, peas, lettuce, the typical cold weather crops are sown, and this late snow won't hurt them one bit. I am glad that I have resisted relocating some hardier plants outside for a few weeks (camellias and rosemary), as a few more nights of 18 degree weather are sure to arrive. No worries, under glass, things are keeping me busy enough as garden planning continues with more seeds to sow. I don't know about you, but I am still ordering seeds, and have barely started ordering plants yet - just a little late, I guess. maybe this is something I can do if we have a snowday tomorrow? 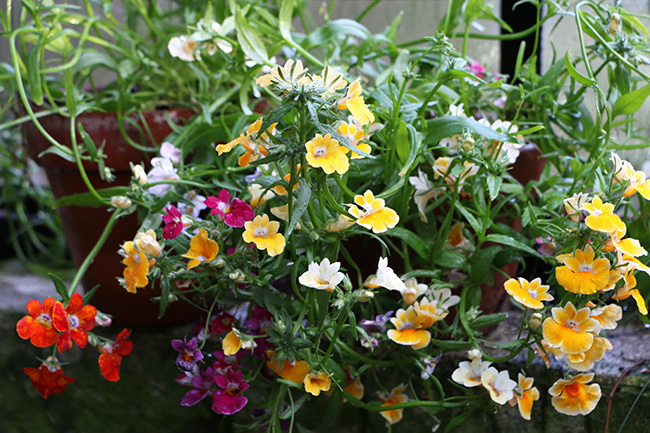 Nemesia, the pots that I've been sharing with you over the past few weeks, are really beginning to look great. Again, these are a great example of how important specific fertilizer is, as well as knowing what a particular genus requires. 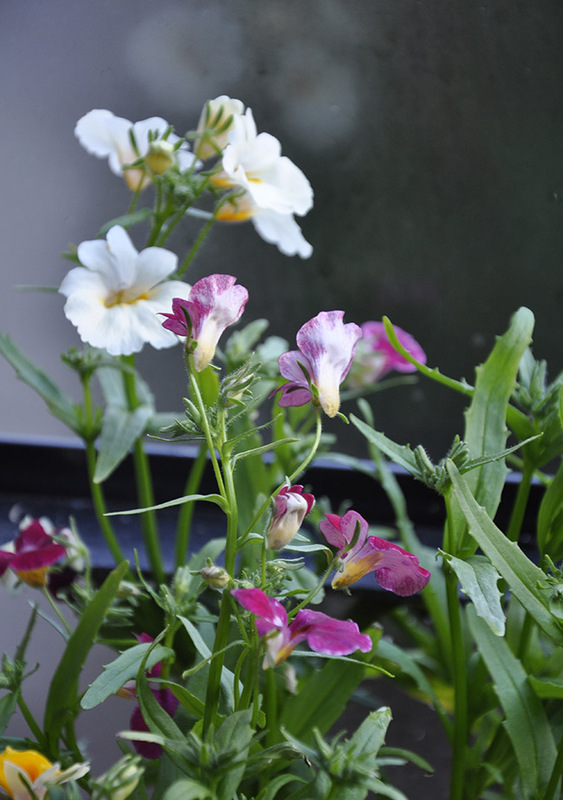 I never had any luck raising nemesia from seed until I learned more about their requirements - particular for iron, magnesium and calcium. These were sown last autumn, and historically, nemesia were common winter cold greenhouse pot plants. 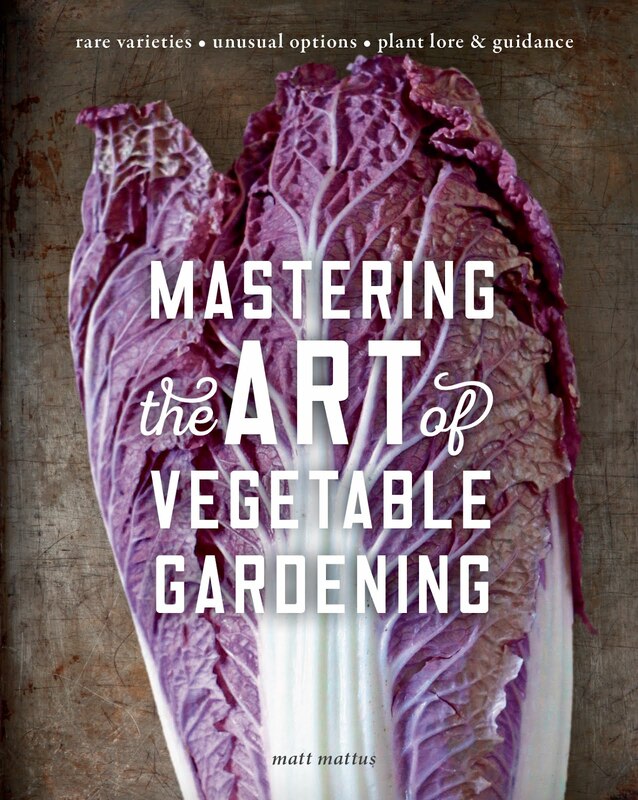 Yesterday, I had the pleasure to give two talks to the Connecticut Master Gardeners association - a pretty incredible turn-out, with about 350 attendees - and both of my talks were sold out, which kind-of made me feel a bit like a rock star. 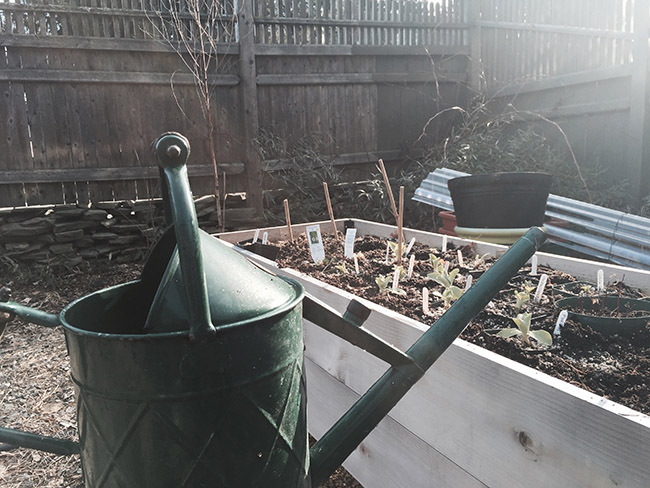 I spoke about old-fashioned vegetables - forcing Sea Kale, Rhubarb and Chicory as a winter crop, and various stories about the history of vegetables. I think the crowd liked it, but it wasn't something that I would typically talk about - so I was up late the night before making tweaks to the presentation, so I am pretty tired this Sunday. What a great group they were, and what a terrific event. 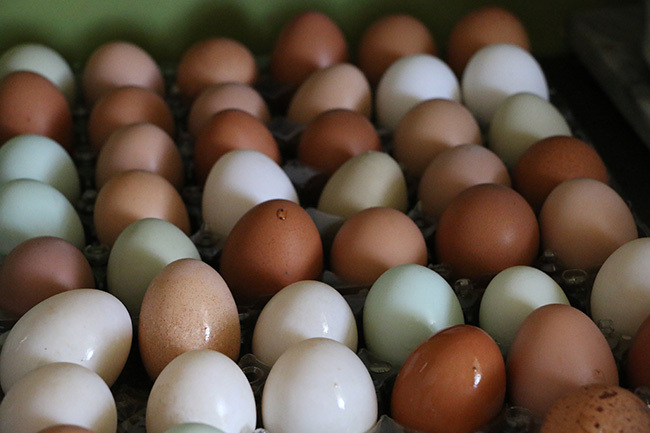 Just in time for Easter next week, I spent the morning washing eggs from our chickens and ducks. Aren't the colors beautiful? We may not have to color any this year. It's high seed-starting time here, as I assume it is at your house too. I know that I forgot to mention that I am raising a collection of lathyrus species (flowering sweet peas - yes, but not specifically the cut-flower sweet peas we are more familiar with like the Spencer varieties, as I am also collecting the species - many of which are currently being used in breeding,many of these have interesting colors such as green and yellow). I've found about a dozen species from three sources, as well as a few from some specialist collectors. Sure, I am raising regular English Spencer varieties as well, but not as many as I have in last years. 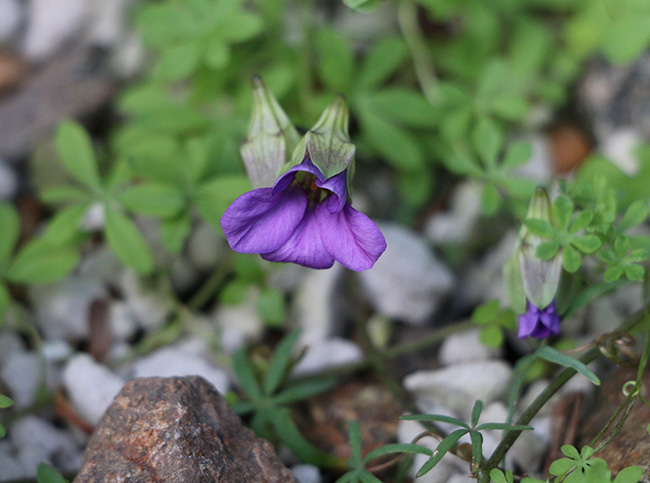 Some of the more wild species of lathyrus are just as interesting as the hybrids. This L. tingitanus will have bright pink flowers. A more unusual annual rarely seen, it is just one of about a dozen new species of flowering sweet pea species I am studying this summer in the garden. I already enjoy it's more delicate foliage, but it does seem to be growing rather fast! 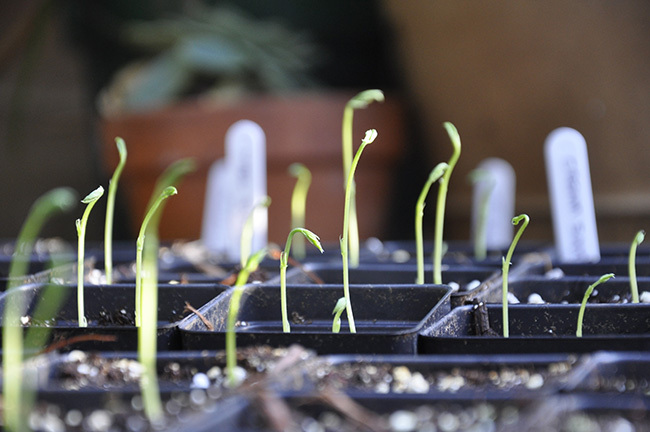 English Sweet Peas - Spencer Varieties, shown here a couple of weeks ago, are now all leafed out and pinched - pinching stimulates the secondary shoots, which are more vigorous, and those are the ones I will train onto canes. I want long stems for cutting. All of these will be hardened off soon, and planted outdoors in a couple of weeks. The above image may not look like much, I am more than delighted, as this blue tropaeolum had suffered a terrible accident last December (my fault!). 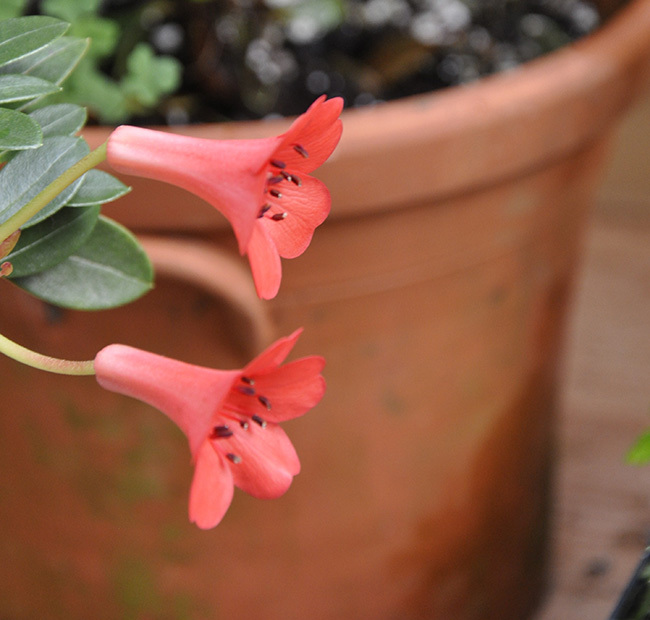 After potting up the tuber of this rare and recently described blue-flowered Tropaeolum (T. hookerianum ssp. austropurpureum a blue-voilet flowering form not to be confused with the other blue flowering trope -Tropaeolum azureum, which I already have in the collection). You may remember the post from around Christmas, when I knocked a pot over of a rare tuberous nasturtium - a blue flowering species recently described? It's always the rare plant, right? After the stopped swearing, and arranged the segments and parts on the potting bench the new shoots on one side, and the separated tuber on the other, I decided to not throw the entire mess away, but to just reassemble the pot as best as I can. I figured, what do I have to lose? Besides, maybe this happens in nature -a rock slide or an animal disturbs a bulbous plant, and sometimes things all work out. One of the blossoms on this violet colored Tropaeolum hookerianum. I am hopeful that both the tuber and the stem have survived, and the good news may (must) be that the stem has rooted in the pumice, and produced a secondary tuber. Thankfully, they have. And although I don't have a vigorous vine tumbling amongst the branches with violet blossoms, I do have a pathetic little shoot that has not died, nor hardly grown in 3 months, deep in a big old plastic pot, but it never died - AND it has produced a few flowers. So, I am rather thrilled. ...and this is the same Vireya with my new camera an lens. (18mm - 135mm) Canon. Japanese chrysanthemum cuttings - gnome types and cascades, rooted in February, have just had their fast pinch. I have to show this plant one more time, even though it is far from perfect or award winning - otherwise I would have brought it down to the Philadelphia Flower Show or to the New England Flower Show. Orchid societies and orchid growers are very selective about the plants they accept in exhibitions, and this one although impressive with its fourteen spikes and 6 foot plus stature, it has some sunburn on its foliage, and some damaged leaves. I really don't care about that though, it is absolutely spectacular this year. So, bear with me as I share a few more photos of this magnificent specimen which is native to Australia - and, one of the worlds largest orchid plants. Dendrobium speciosum selections are difficult to find, probably because they are so large growing, so here in the East, they are less common than they are let's say, in Western collections. 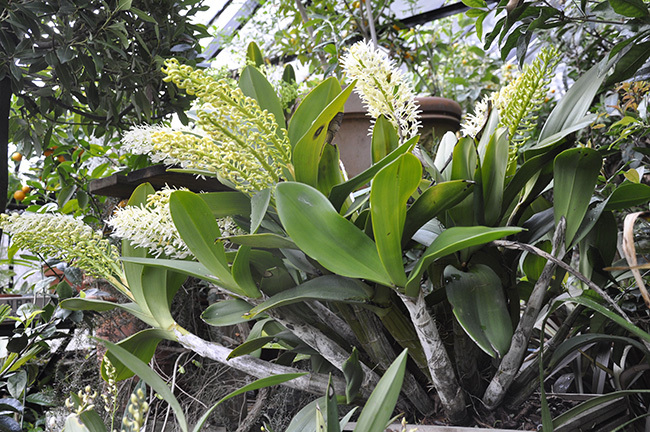 Most of these Australian native species are cool greenhouse orchids, so they should make useful cool house plants, if you can handle the size. 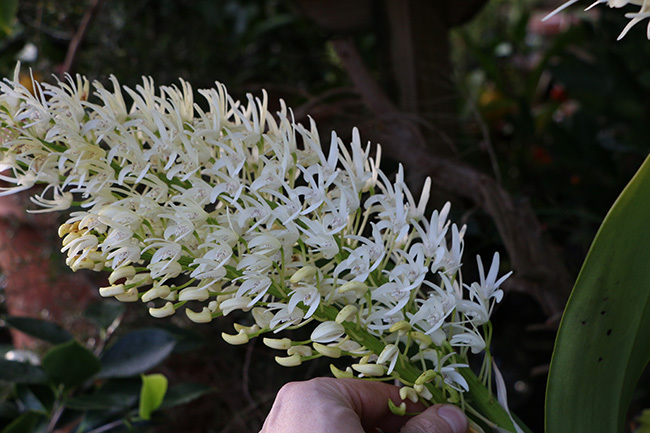 That said, there are many smaller cool-house dendrobium from Australia that you can try. 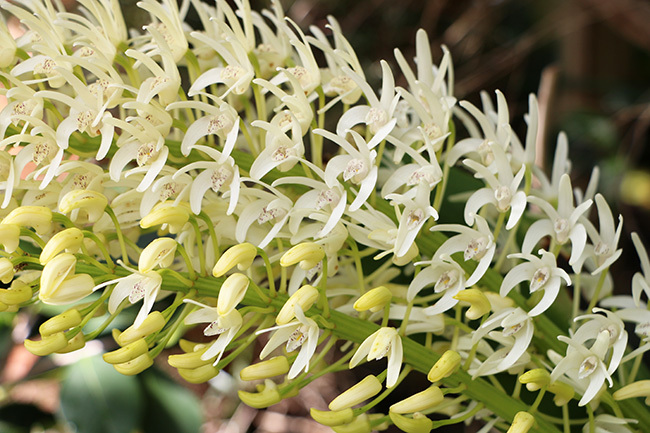 IN particular, the many crosses with this species and other dendrobium. 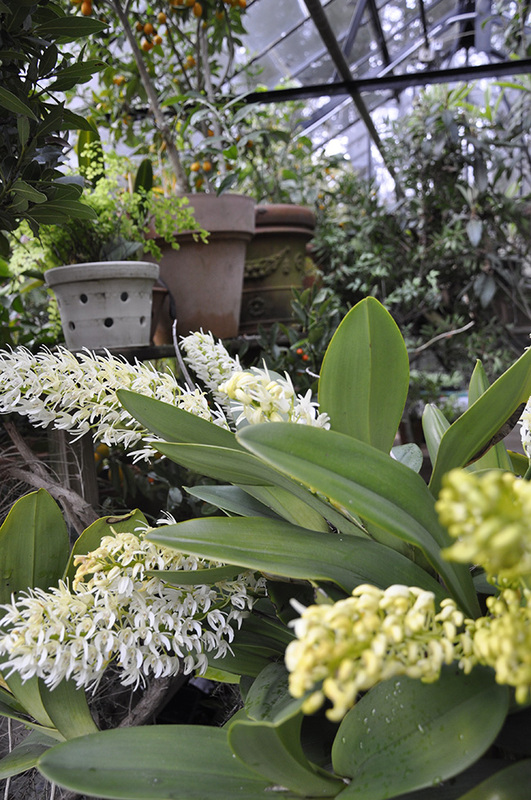 Check out the selection at Santa Barbara Orchid Estates. That's where I ordered the young plant of this one. 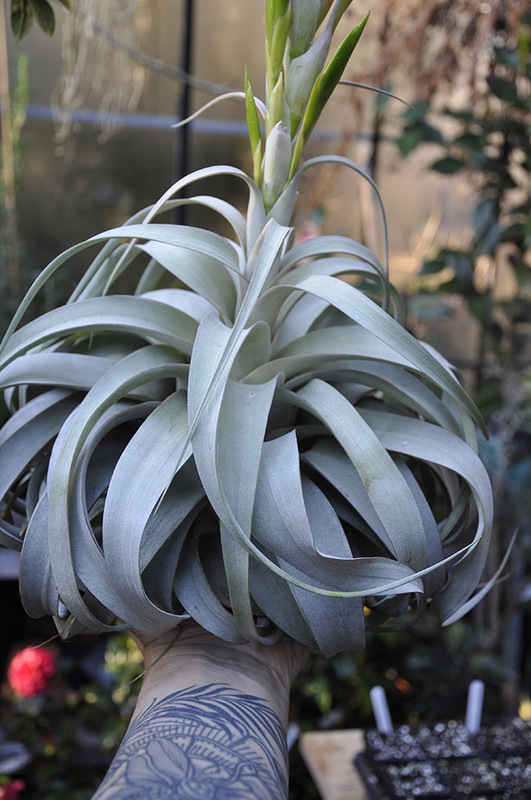 The entire plant of this D. speciosum is so large, that I would have to open both doors of the greenhouse, to move it outdoors. The slat basket is 24 inches in diameter, and I am wondering where I could find a larger one when I have to repot this beast later this spring. If I counted every orchid blossom, I wonder how many corsages this would make for Easter? If people still wore orchid corsages on Easter. 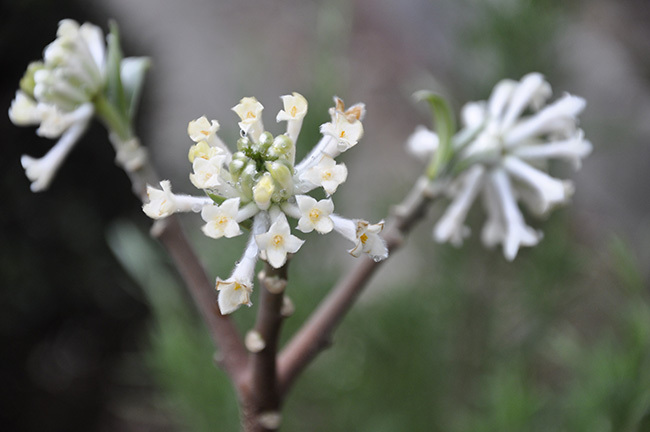 An Edgeworthia continues to bloom, in the greenhouse. I really enjoy this Asian shrub, but the akebono variety is really nicer, with its orange and yellow blossoms. What's this yellow flower on the floor? So, here was a surprise today. 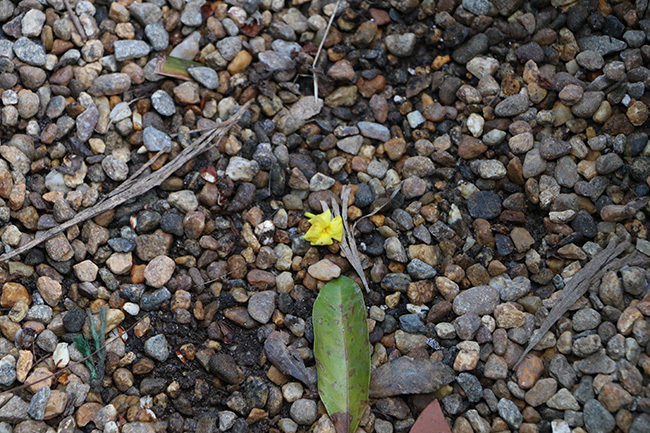 I vine which I have barely noticed for a couple of years, is blooming, and I wouldn't have even noticed it, if I didn't look down and spot a single, yellow blossom on the ground in an aisle. Jasminum 'Revolutum' or Jasminum humble. A vine which I planted as a cutting a few years ago ( from Logee's). I knew that I smelled something jasmine-like a couple of weeks ago, but I could not find the source. Little did I know that it was 12 feet above me. 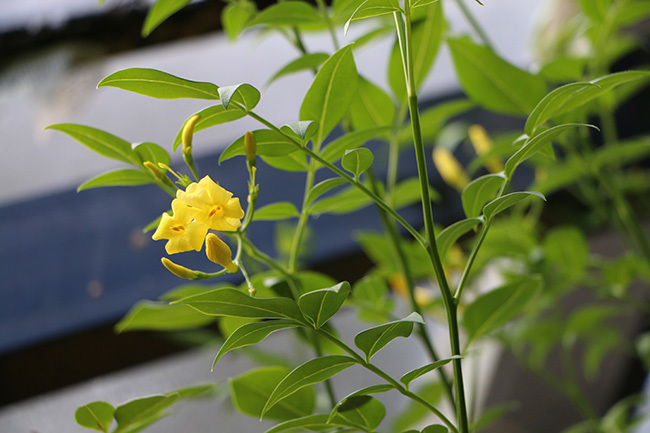 The yellow jasmine 'Revolutum' was trained along a beam high in the greenhouse, and was partly hidden by other vines over the past two years, but they were cut out this autumn when I decided that they were too vigorous to be allowed to grow any more - something, which one must expect with vines in a greenhouse! This may have a similar fate in a couple of years, but for now, I shall enjoy it's blossoms and scent - and just before a blizzard hits too - how perfect. 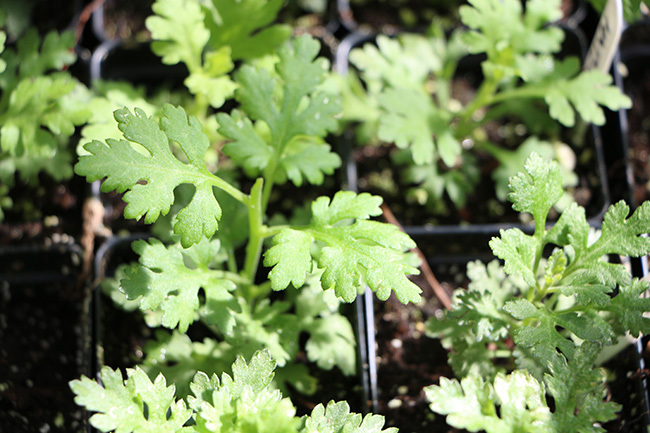 Parsley seedlings are almost ready for transplanting into individual pots. 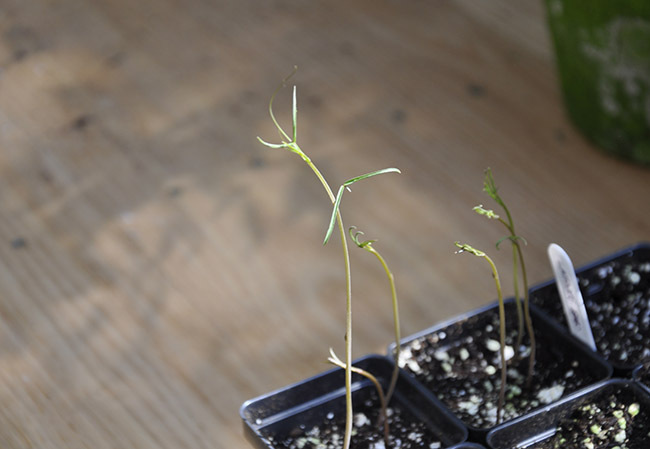 Parsley is tap rooted, and prefers little root disturbance, in particular, the flat-leaf types, which tend to sulk if transplanted too late, or with disturbance. I should have individually sown the seeds I suppose, as I do my Hamburg type Parsley, which is grown for its white paring-like roots. 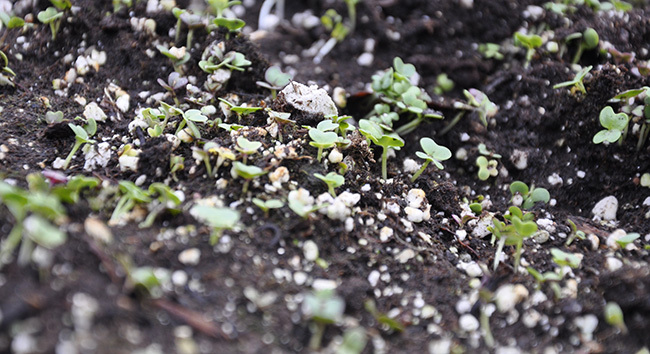 The mesclun is up and growing already, even though it is just past St. Patrick's Day. These are being raised in a cold frame, so tonight snow should not hurt them. 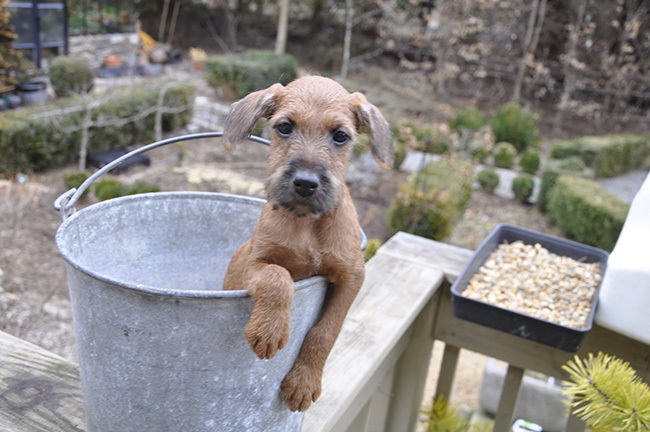 Irish Terrier Puppy shot - puppy number 3! They're getting super cute, but off to their new home in a couple of weeks. 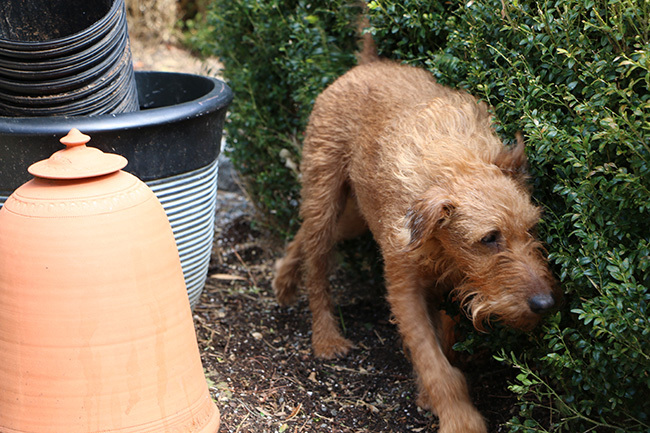 Doodle (Daphne), rubbing her back on the boxwood - like her father Fergus used to do. Just what a want, a boxwood-scented dog (actually, I like the smell of boxwood). A New and Improved Better Homes & Gardens? Perhaps so. I was sent a complementary copy of the newly rebranded Better Homes and Gardens magazine. Maybe it's because it's the gardening issue, but I have to admit that I like it. Do I sound surprised? Ready on, and see why. Ok - total honesty here. I received a text last week from an assistant at Better Homes and Gardens magazine asking me for my address because "Stephen Orr is a big fan of your blog". Which is very nice. I accepted the request to review the magazine, for many reasons - (one definitely not being because 'said magazine' had just nominated this blog for an award - (well, you the audience nominated it - but still). It's not a secret that I too love graphic design, magazines AND gardening, but I am well aware that we are talking about Better Homes and Gardens, which may cause some of you to roll your eyes - I know this, since I've received the emails. Here's what I can say - I can appreciate Better Homes and Gardens efforts, and why not? We should all be supporting any effort to improve the visual design and content of our beloved sport known as gardening. 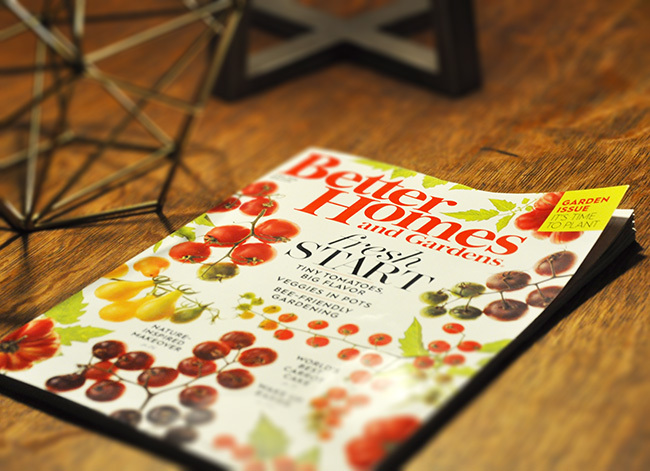 Better Homes and Gardens apparently has gone through a bit of a renaissance over the past few months, call it a re-branding or re-design, it does look much more hip. Well, a little more hip. After all, it still needs to not distance itself too much from its core audience. All of this change is likely due to their new Editor-In-Chief Mr. Stephen Orr (formerly a gardening editor at Martha Stewart Living). Both magazines ( now both under various umbrellas of Meredith Corp. in one way or another), they are both in the process of refreshing themselves in an effort to escape survival mode in a world where digital media is challenging the established print media. I always appreciate a gardening issue that doesn't cost $9.99 at the register because it's a 'special', and comes with a regular subscription. 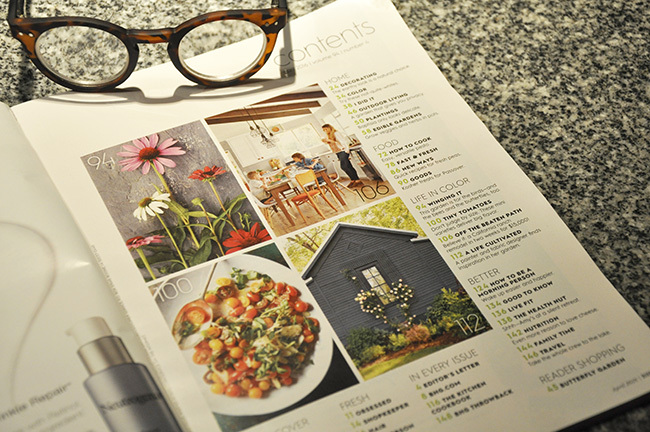 The April of the newly designed Better Homes and Gardens demonstrates how a brand can update itself to be more relevant. This could potentially attract a broader duel-gender audience, without alienating it's core reader. At least, I would buy this issue. I received my complementary issue of Better Homes and Gardens yesterday, and it is indeed much better than the previous design (but I will admit that it looks more like Martha Stewart Living, than perhaps Martha Stewart Living does. More on that, later. Really, it looks quite nice, I have to admit. 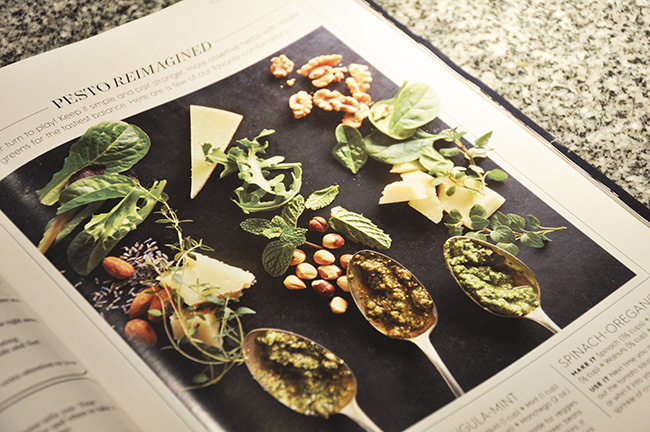 Sure, it's a story on pesto, but nice enough not to be boring, which means that I took the time to read it. I'm not being snarky at all, for it's images and nice typography like this, that I want to curl up in bed with (does that sound dirty?). You will soon see the beautiful cover design on your newsstand - a bright, cheerful image of various tomatoes on a white background. This surprised me because I was half expecting a young mom on a porch with a white picket fence and hydrangeas, with lots of call out type in bright, well curated colors somehow themed to some seasonally-approprate content like - "Mellow Yellow" or something less-than pithy, but cheerfully banal about...let's say, "spring!". So this new cover concept which shows an honest, yet clearly curated studio shot, - trying to look like nothing other than a gorgeous studio show, is refreshing and real, and for this magazine that has desperately needed a refresh, it is rather progressive. That said, I do wonder if Meredith will ever have enough balls to someday show a guy on the cover? It couldn't hurt - (um....think Brawny folks - I think even girls like a little boom boom to break through all of the clutter of a busy life, and.... sometimes a little 'sexyness' sells). Just sayin'. So well done BHG - and even if the covers in future issues end up just showing beautifully curated images? This will all be an improvement over the usual slick casseroles and pastel flower motifs featuring sunflowers and sunny, yellow curtained kitchens. I know, I know, it's a ladies magazine and there are clear boundaries here to never cross, but it is also 2016. My other (slightly bigger) issue is probably the thin paper stock, but I understand the realities of economics of this (although, is it me, or does this issue feel better than the January one?). Of course, I shouldn't forget to mention the reduction of the word 'Gardens' in the masthead. <sigh>. Oh marketing team, really? (smile). 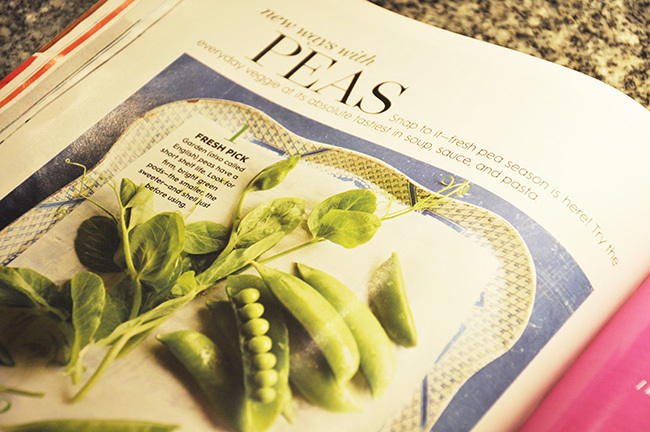 Even a story on Peas, could fail with bad photos, but if crafted properly, even an expert cook or gardener can find escapist pleasure in it. Magazines today must work harder, to earn our time, which is so precious. After the January issue was released, on that very next day, a few of my designer friends (graphic design friends - the sort who like to crit such events, like those from RISD) texted me to chat about the issue (yeah, we do things like that). We shared what we liked, and what we hated. Surprisingly, we 'liked' a lot, in an 'nice improvements sort of way', and we all agreed with the issues above - - thin paper stock and cover, but kudos for better typography, and what seemed like a lot more content. I think originality will always be an issue in a world where Pinterest and blogs seemed to have covered everything three times, but personally, I would like to see BHG develop it's own voice and visual language, if not one which is stylish and current, perhaps even one which could lead rather than follow. I think it's too early to be judgey about that, yet. The January re-design was not thick magazine, and the thin paper stock didn't help, but I reminded them that it was the month of January, first quarter - and traditionally January was a 'thin' month for advertising pages, and that maybe they'll have to work to get advertisers back now that Orr is at the helm? I also added that maybe they are trying to find a new audience, ( which seemed pretty clear) since the market for 'granny mags' is getting thinner as well each and every year. Just look at how Redbook drastically changed it's design and audience, (although, perhaps not for the best). I should mention that the website looks different as well - not sure if it is better or not, but I do like it better than the current Martha Stewart web experience. If it wasn't for Martha's Blog, I would be so frustrated with the endless pop-ups and video ads, that I would never visit it again. I'm sure they will evaluate that soon, but the BHG.com site is looking nicer and more usable. My concerns now are - are the two magazines becoming too similar? Look - a man, in Better Homes and Gardens! I imagine that Meredith, who to make it clearer, officially only licenses Martha Stewart Living from the Sequential Brands Group, the magazine's owner, is busy rebuilding their entire magazine shelf space, and that these both are approached more as franchises. Thinking of the brands in that mode, I have to put some thought to who the audiences are, are they different and are they merging? I did notice that the Martha Stewart Living advertising guidelines listed their core audience and women ages 45-55 now while last year, the demographic was ten years lower. That's interesting, but probably more accurate. I would also imagine that the Better Homes and Gardens demographic perhaps earns a bit less per household - only guessing here, I am just basing this on their brand positioning - in my head. So approached from that perspective, the two may be able to exist if the content can remain on-brand for each, without cannibalizing each other. Where gardening factors into the mix, I don't know. I would wager a guess that 'the idea of gardening' for Martha Stewart is currently in a stage of flux, trying to find it's new audience, while the gardening consumer for Better Homes and Gardens might be more accessible, or open to growth. I only base this on my personal beliefs about each property, assuming that the Martha audience is slightly more affluent and thus, more concerned with status and appearance, while the Better Homes and Gardens consumer may want 'easy casual beauty' that is attainable and achievable. Martha Stewart Living equals 'style', while Better Homes and Gardens equate with leisure time projects that are fun and family oriented. Look another one! And, Pinterest-worthy ideas. Perhaps not sensible for the Northeast, but, I'm always open to new ideas that I haven't seen elsewhere. Here is a weird observation. This issue feels a bit, dare I say, 'duel gender'? Now, maybe my gender antenna are sensitive lately since I've been secretly (or not-so-secretly after last months press announcements at International Toy Fair) working on a huge duel-gender project at work,but I 'feel it' here in the magazine, as well. Much of what I was secretly working on drove a duel gender aisle at major retailers, so maybe.....Better Homes and Gardens is realizing that the old Martha audience was either female, or guys not afraid of 'feminine pursuits'? It all looks attractive, but aside from the make-up and beauty articles, I could leave this in our manly bathroom and not feel too embarrassed as it sits next to Men's Health. Looking nice' doesn't necessarily mean 'gay' in 2016. Again, just an observation, guys. Not judging. The newly designed Better Homes and Gardens is both contemporary and content rich, especially in this gardening issue, April, 2016. I good mix of everyday mass market with good design and fresher-than-normal, content. That said, this gardening issue, is well endowed at 148 pages, and call me crazy, but the cover stock feels thicker than that January issue. Not that it's all about size, but it does add to the experience. back to those inner pages (I know, paper stock again!) they are thinner than Martha Stewart Living, but not quite at that cheap-toilet-paper-from-the-New-Jersey-Turnpike-sort-of-way. I 'get' cutting costs in mailing weight, as as long as they ink doesn't bleed through, and the binding holds, I' guess I can live with that. I mean, we all throw them out eventually, but - now that the photos and recipes are more usable, I may want to save them as a hard copy. Many of us still have most if not all of our Martha Stewart Living issues. 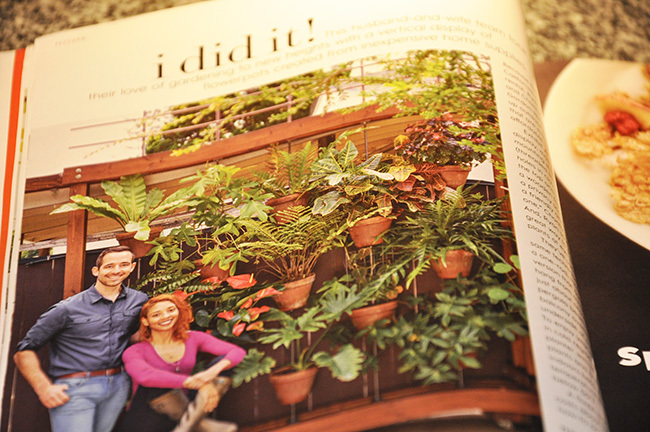 Over all, this gardening issue is a big improvement over last-year's version of the magazine. It is well curated, I actually could read the content, and it is beautifully photographed. Expected? Sure, but there is different between "nice and stylish' and dated. It is no longer dated. best part of all, it has gardening features on REAL gardening topics - - like a story on Baptisia selections (I know, right? Baptisia selections in Better Homes and Gardens? Who'd a thunk?). I should give credit also to the BHG's gardening editor Jane Austin Miller - and by the way...when did they get a gardening editor, anyway? Somehow, I missed that! Jane seems to have contributed in any ways throughout the magazine, and the idea that BHG now having a gardening editor on staff, sends the message to me that there may be more gardening articles in issues beyond the gardening one. 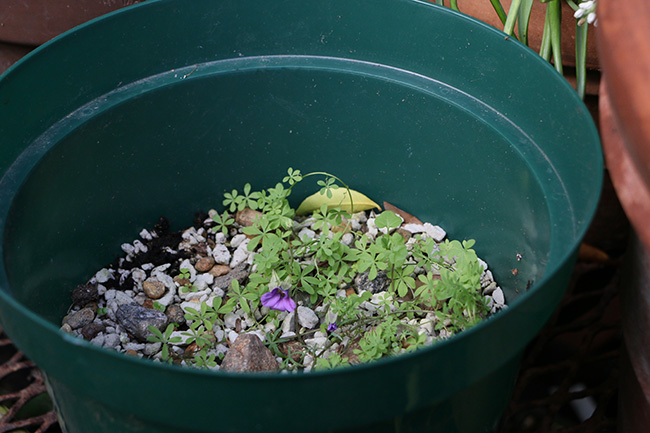 Jane's article on container gardening is worth pointing out, as it presents a refreshing take on that cliche of all subjects, container ideas. Finally, a story where you can tell that they really grew the plants in the containers shown, rather than shoving in a bunch of full grown plants to fake, and instant display that feels more disposable than an actual, practical story. Good job! 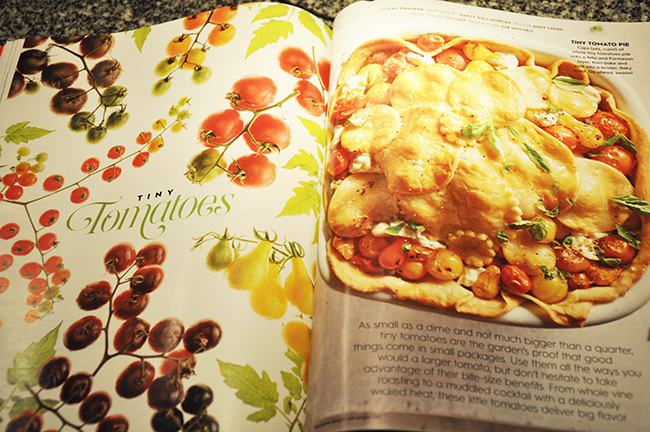 The tomato article is spectacular, with both tomato cultural information and original recipes. I really can't imagine how any lifestyle magazine can survive today in a world were ideas are shared instantly, but this story is an excellent example of how a magazine can, and does, deliver content in a high-value way. 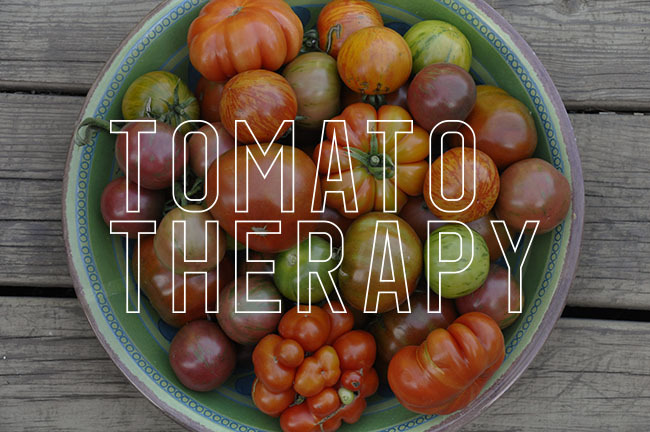 It's not just a story on heirloom tomatoes arranged in a bowl. The food photography is bright and visually relevant as I am getting a little sick of the dark moody shots that look as if they were shot on the floor of a gas station in a third world country. ( ahem - Food & Wine). I love great design, but micrograms and foamy soup shot on rusty, greasy metal with denim just isn't that appetizing. So aside from the fear of one getting lockjaw, I usually don't find the idea of getting depressed when reading stories about holiday spreads. That said, I don't want the old bright, sterile and cheerful studio lighting (ala-Kraft 1995 either). This issue offers a nice middle ground style, perfect for mass market, and probably for the brand. The gardening photos are meh - and I can't say that the planting schemes will give me any specific memorable ideas, but then again, I am not the target audience I suppose. Still, a story about a butterfly or pollinator garden could have been called most any theme, so it felt too 'positioned'. At the end of the day, did I find this issue truly inspiring? I didn't hate it. 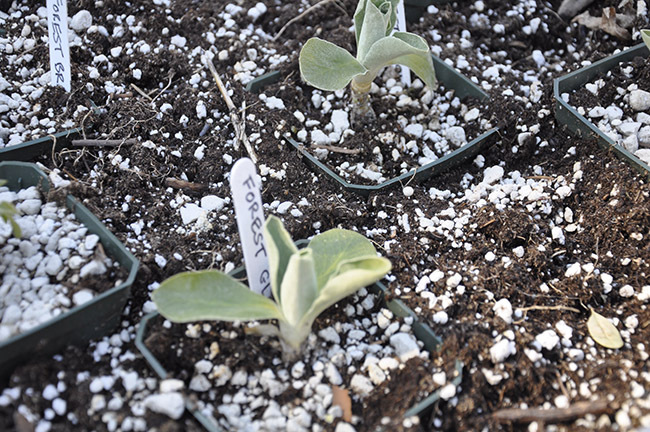 I mean, I am ordering more Baptisia now, but of the other articles and stories while again, I am not the target audience, should appeal to the beginner and the intermediate casual gardener. 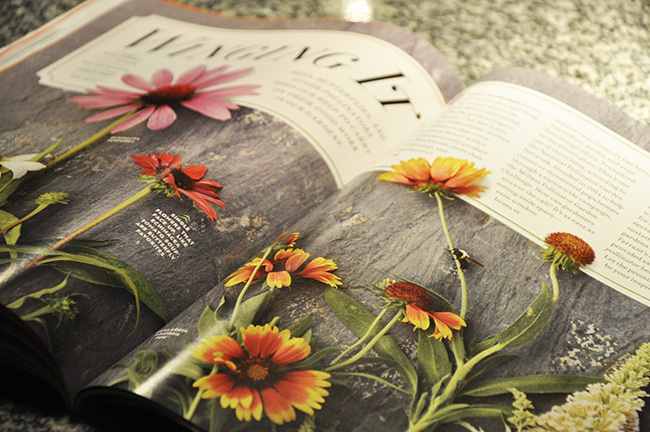 This redesign does not position the magazine as Gardens Illustrated or Garden Design. It's more like Martha Stewart Living lite (I don't mean that in a bad way, either). It's WAY better than Family Circle (do they still publish that?). 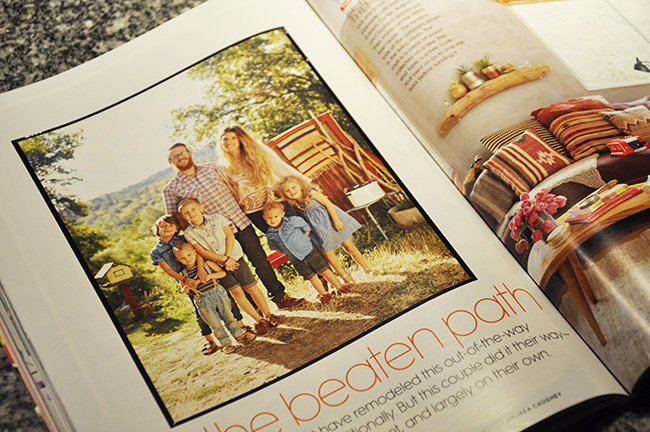 The old Better Homes and Gardens was exactly like Family Circle, and that was NOT a good thing! If you are interested in subscribing, you can find a subscription to BHG here. This is not a sponsored post, and even though their logo is in my sidebar, no one has paid for this review. 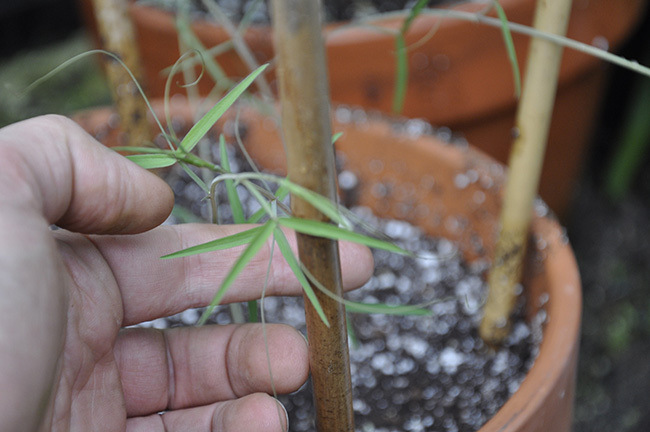 a complex mix of water soluble 12 - 6 - 22 allows this species to now absorb and use iron...but why?Two weeks ago, this was a pot of spindly, chlorotic seedlings but with just an adjustment of food, it has taken off with just one tweak. A perfect example of why one should pay attention to soil pH, electrical conductivity, and special fertilizer formulas.So even though they needed calcium and magnesium, if I added egg shells, or Epsom salts, I would have killed them. I'm working on this story for another post. Fertilizing is much more complex than we could ever realize. Joe and I are hosting a baby shower for our good friend Kelly this weekend. This is completely new territory for us, and I realize now was we got ourselves into. I had visions of French Macarons and Pinterest-worthy Ombre baked goods, but I may have lost control as balloons are being tied onto out lamp posts outside (I suppose, in case someones Google Maps isn't working), and I am certain that a 'diaper cake' will be arriving soon. I've been fussing with these Nemesia seedlings this year, discovering what I was doing wrong all of these years. It all comes down to soil conductivity ( electrical conductivity), how it affects pH and fertilizer uptake. 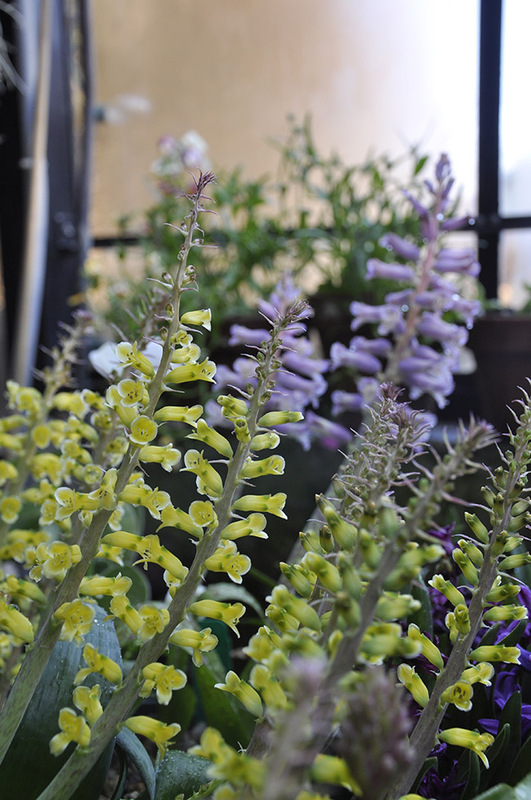 This is a common imbalance with petunias, snapdragons and nemesia, and it will result in yellow foliage, slimy green soil and a chlorotic plants - all signs of a deficiency of magnesium and iron. 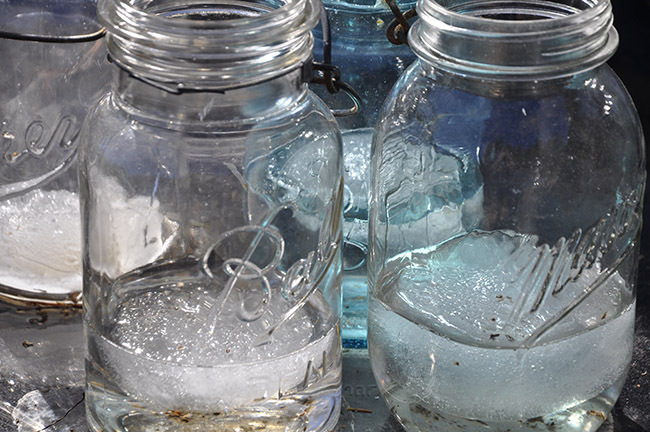 Do you know what you are feeding your plants and why? It's science, but easy to fix if you don't mind getting a little geeky with your research. More on this, later. Given that last week we hosted the inaugural meeting of the New England Dahlia Society here, and now 50+ guests on a Sunday, and next weeks double lecture I need to give at the Master Gardeners Association (CT), and then Iceland for two weekends - Look, I'm kind of booked until mid May. So, this is my long winded excuse for a shorter than normal post - and even though I am working on finishing my seed starting post which has taken far too long to write, since I wanted it to be unique, it shall have to wait. Maybe for a long plane ride through the night. For now? Random garden images from this week, since these are just plain easier to share with you. Even through we are certain that this is the warmest winter ever recorded in the Northeast, I am enjoying the warmer than average temperatures - it hit 77 deg. F last week! But then 22 deg on Saturday night. Hey - it's probably good maple syrup producing weather, as long as it dips below freezing at night. Our mild December didn't seem to harm some early blooming shrubs, even though I though that it might. 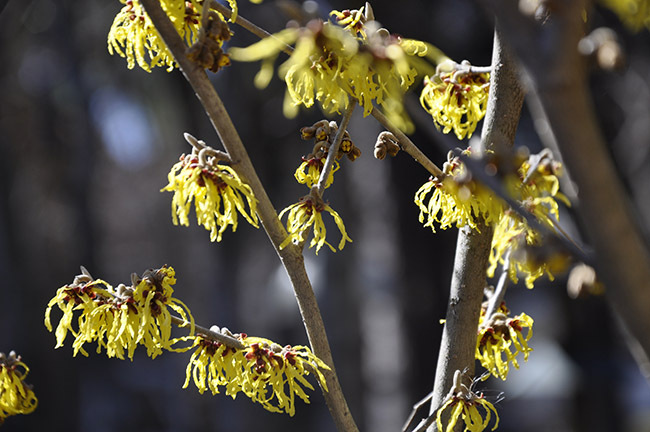 This Hamamelis x 'Arnold's Promise', is not only a reliable bloomer during mild winters, it's hardy for us. 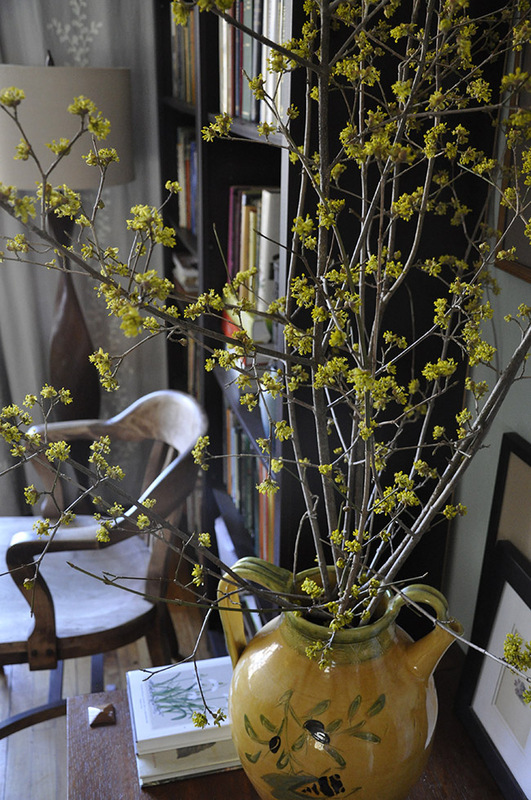 Long branches of this Cornelian Cherry, or Cornus mas, a dogwood from Asia, are perhaps the easiest to force. These came into bloom in just 24 hours once brought into the house. 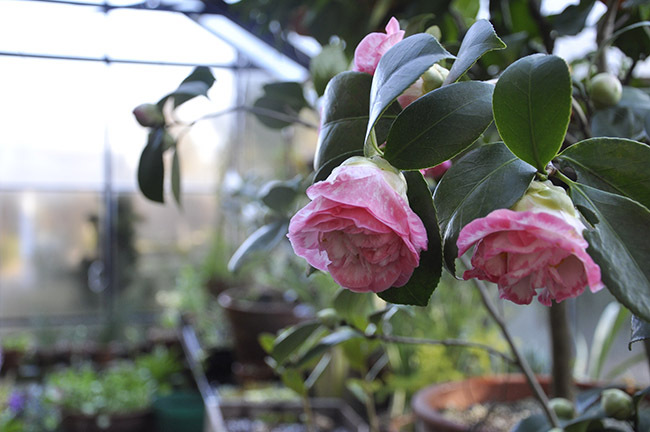 In the greenhouse, the camellia's continue, but I have to be careful, as the shade cloth is not up yet, and if the vents don't open, the temperatures can rise to above 80 deg. F in just a couple of hours on a sunny day. 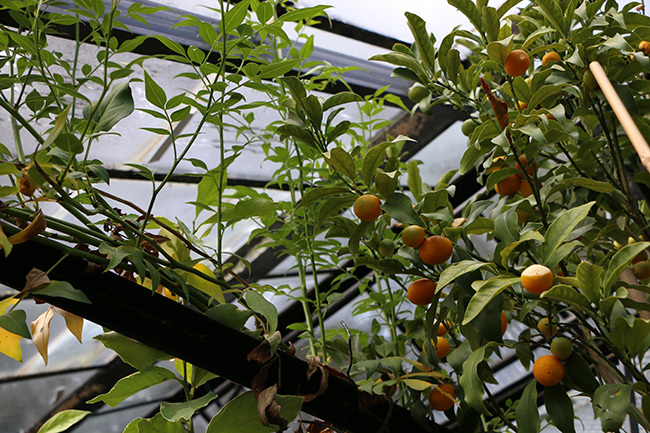 The greenhouse vents have remained open most of the week, which is a good thing, since may cool-greenhouse plants have yet to bloom, and a warmer than normal season can abort many from blooming. 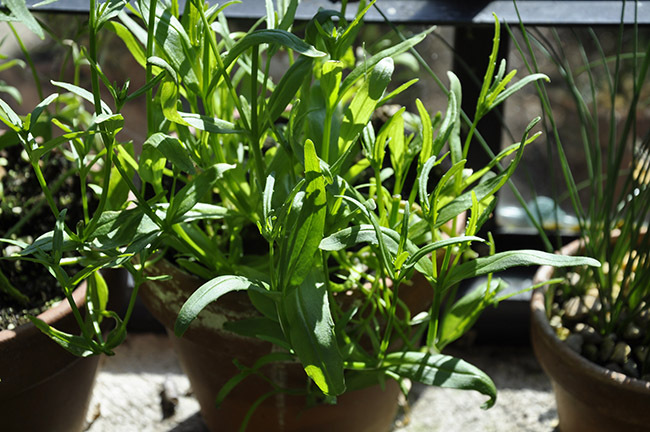 I try to avoid great temperature shifts in the spring but many plants require the difference, especially some seeds. 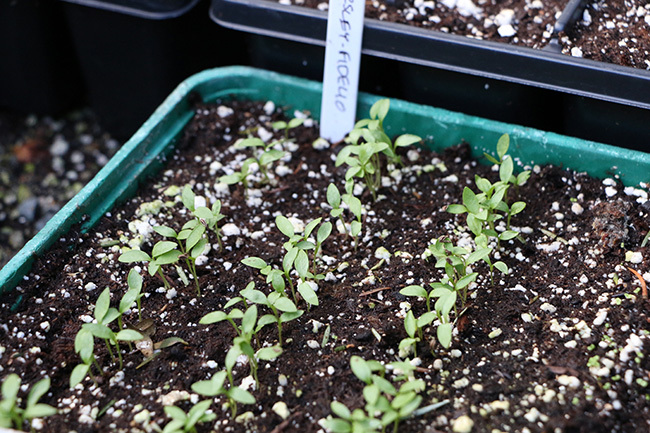 Peppers, tomatoes and eggplants as well as snapdragons and petunias don't, so they remain indoors until the spring temps regulate more. Cape Hyacinths, or Lachenalia species are blooming like crazy now. 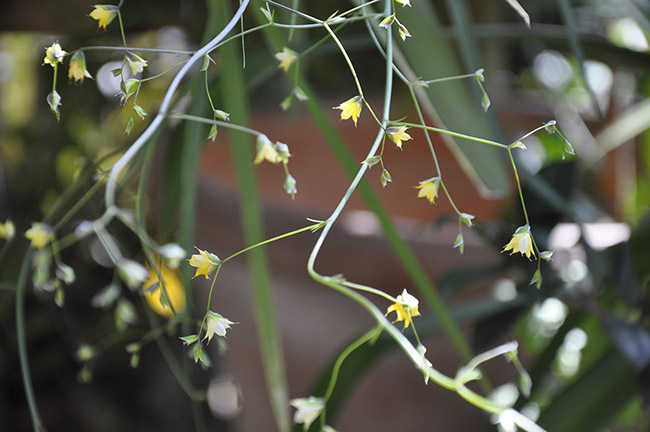 So easy to grow in a cool greenhouse, you could attempt some in a cool plant window in the winter, as they are like paperweight narcissus in that they don't require cooling off or vernalization. That said, they do require day to night temperature shifts, and cool, air temps during the day. 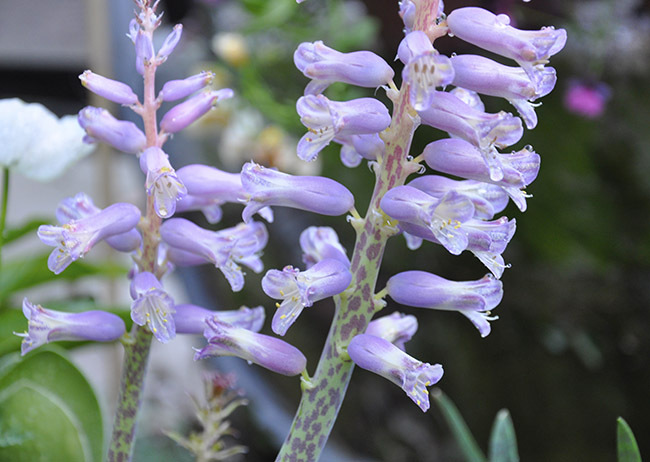 Lachenalia now are available in hybrid crosses, the most common being African Beauty series. Look for them in both spring and fall bulb catalogs, they often include a few, but remember, they are not hardy outdoors. 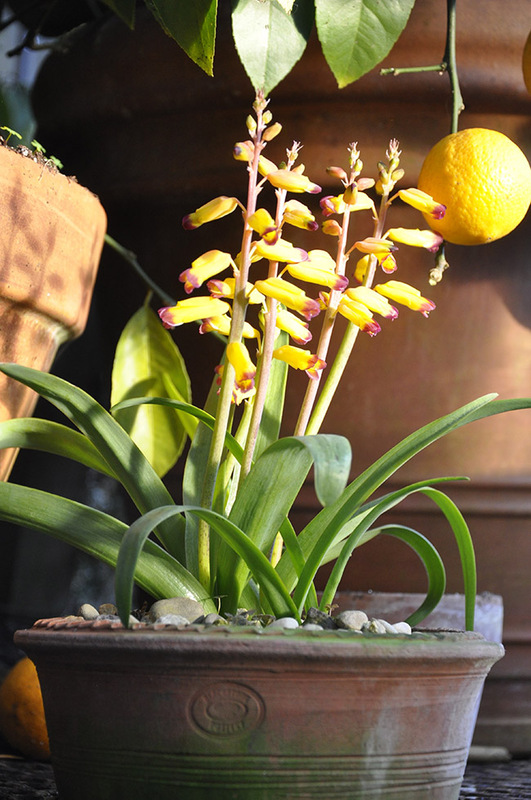 When offered in the spring, Lachenalia can be potted for outdoor spring displays (short lived) or in window boxes. Just be sure to pull and dry the bulbs off for the rest of the summer. At that point you could repot them for winter flowers, swapping over their normal 'Southern Hemisphere/Northern Hemisphere growing cycle - remember, they typically bloom in South Africa, during their winter, which is our summer. 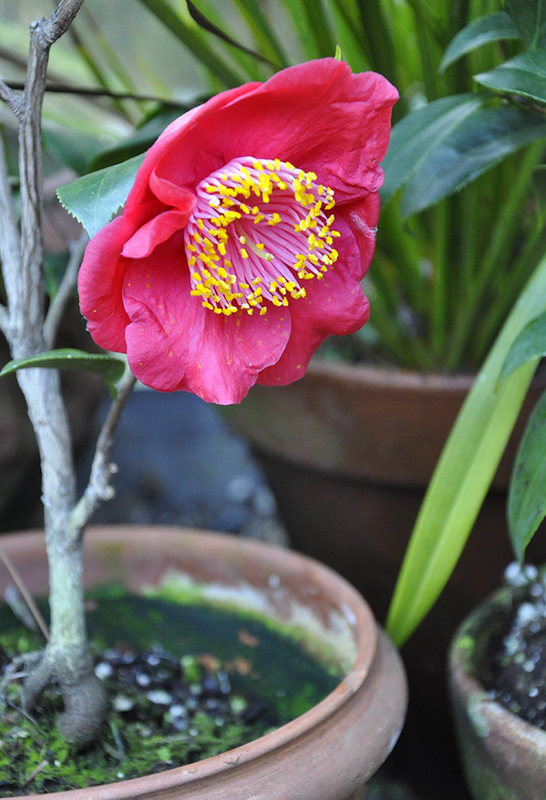 I lovely new camellia blooming late, in the greenhouse. This one is Hi-No-Maru. 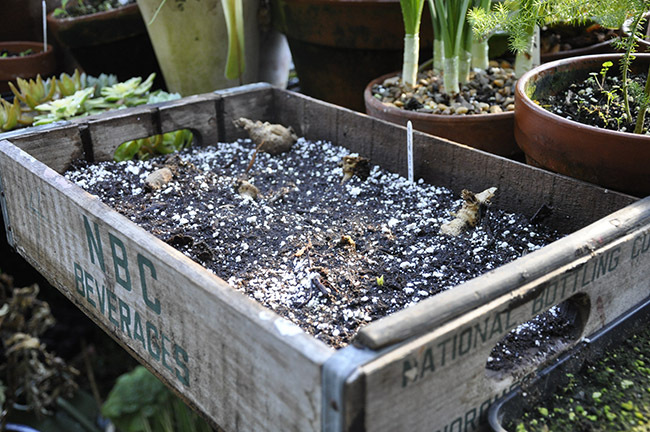 Cafe au Lait dahlia tubers, being propagated - these are planted in wooden flats so that I can strike cuttings. An impressive Tilandsisa xerographica which was a gift from my friend Chau Ho, who came to our Dahlia Society meeting on Saturday. Dahphe (Doodles), looking rather lion-y since she hasn't been groomed. Kind of funny to think that her twin brother was the No. 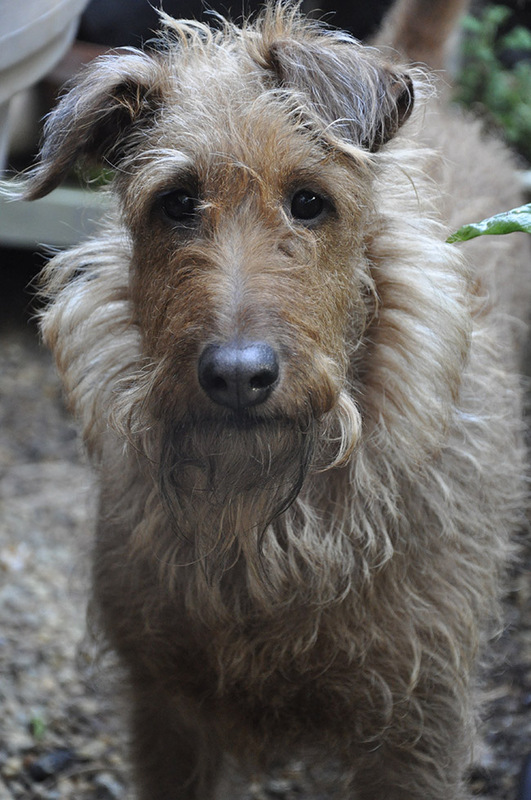 2 Irish Terrier in North America, and No. 3 at Westminster last year. Doodles? She's rather get muddy and chase squirrels (and dig up lily bulbs). 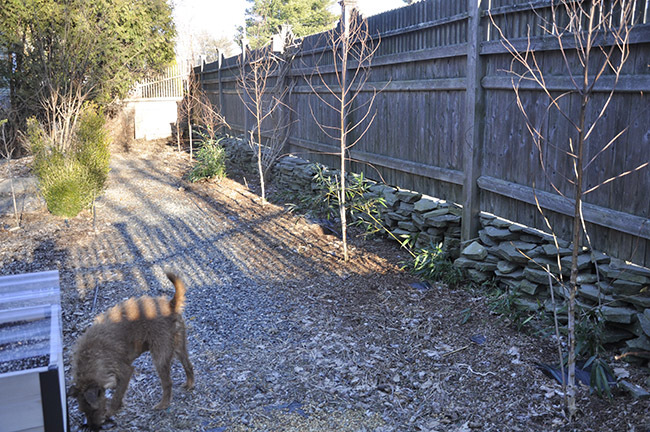 Here's a view you don't often see - a new border of Himalayan Birch trees that I planted along our front fence. They are just beginning to show some color in their bark. Layers of weed block are still trying to hold back a colony of bamboo, which had been there for years. It's almost gone...almost. I am still trying to master raising Auricula primrose. Most of these are alpine forms, potted in a mix which is mostly pumice, with some soil. They survived the winter in a raised bed which was covered in a half-assed way, since my new cold frame cover had not arrived yet. They were cleaned up last weekend, dead leaved removed, and fertilized with their first dose of weak all-purpose fertilizer, necessary during these first few weeks when they awaken. They will be covered again with the poly cover, to protect their nice foliage from rain. The exhibition varieties have a white coating on their leaves, which can be washed off. In the Alps, they grow in the clouds or higher, where rain cannot rinse off the powder, which protects them from the UV rays in the bright, alpine sun. 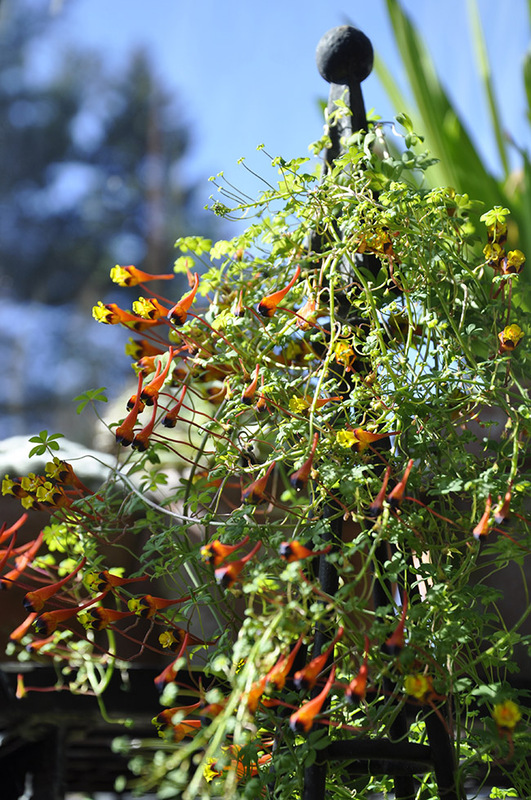 A pretty Tropaeolum tricolor again (I had to share it one more time) in the greenhouse. This nasturtium family relative grows from a potato-like tuber, and has been a secretly popular cool greenhouse bulb since the 1800's, but rarely seen today. 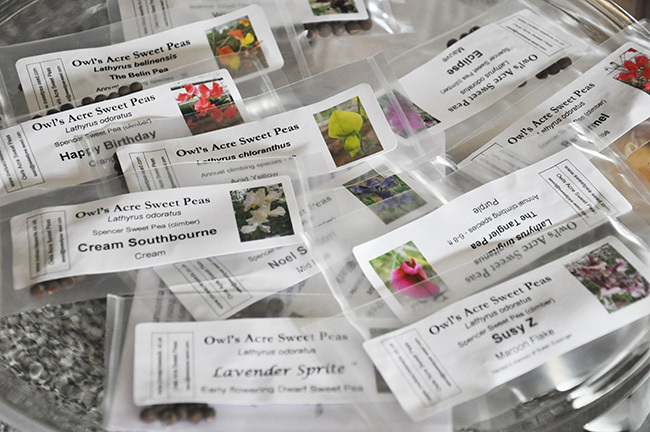 I am raising a collection of rare sweet peas - or peas, to be more accurate ( Lathyrus species) which are raised by plant collectors for their flowers. One of my many projects this year. I know, I didn't mention it on my projects list! 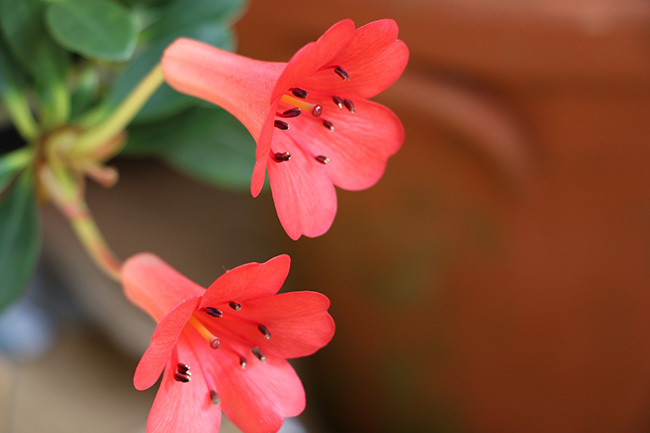 A rare bulb blooms in the back of the greenhouse - any idea what this one is? I have the name on the tag, but maybe a prize exists for anyone who wants to name this spring blooming bulb which is the only one in it's genus, but closely related to the gladiolus.